Is "something more" calling to you? Are there dreams you're longing to fulfill? Now is your time to begin. Camilla's house reflects her inner life. She is always busy making her front yard immaculate, but she lives with the hidden truth of sealed-off messy rooms and a backyard filled with trash and weeds. One day, Camilla hears a ringing bell behind a closed door and courageously chooses to enter. The transformation that follows reveals all that is possible when we listen to our hearts. 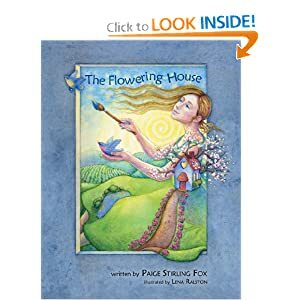 Opening with a simple, inspiring story, The Flowering House provides the reader with a guided journal for personal explorations, and calls to all who long to awaken to and more fully express their purpose. In this book, Stirling Fox is telling women that the best moms recognize and follow their own dreams, too. The book features a brief fictional story of a young woman who is too harried to accomplish her dreams--much like many moms today. Stirling Fox then features a series of journaling prompts that encourage readers to take the book’s themes and apply them to their lives. Peppered throughout are truly vibrant, engaging visuals that connect what’s happening on paper to the transformation within the reader. The journaling section doubles as conversation prompts, making the workbook a perfect companion for both personal and group reflection. Paige Stirling Fox is a life coach and facilitator of numerous personal growth and spiritual programs and workshops. She believes in the power of circles of women and has created and led many programs, including Women Circling the Earth, a year-long retreat and coaching program; and Breathing Space, circles for women who have survived cancer. Paige earned an honours degree in psychology and a certificate in adult education, and she has completed coach training with Coach U. She is a Reiki master and a certified labyrinth facilitator. Paige currently works as an early literacy specialist and lives with her husband and two children in Ontario, Canada. The book itself was a poignant story that brings out so much for the reader to reflect on. While the story is aimed at women, as a man in a home of women, I can see the relevance in many women's lives. I can tell that this book can definitely help a person redefine the way in which they are living and want to live their life. The nice thing is that the book makes this process both fun and easier to attain through an easy to follow story, but so many guiding questions that will make the reader look inward to make decisions that will help them move in the right direction for their life. This is a great book for anyone looking at redefining their own life! Sharpie Presents a Great New Contest! Giddy Up & Go Granola Tastes Simple Amazing! FINDING NEMO 3D - "JUST KEEP SWIMMING PSA"
GUND's Top Dog Contest - Enter Today! La Dee Da Launch Event - SAVE THE DATE!